I adore canning and especially love surveying the pretty rows of brightly colored jars when I’m finished, but you can bet that if I can safely take a “shortcut,” I will. When I decided to can pears last weekend, I was slightly dismayed to find that all the recipes called for peeling (not an easy task with a slippery, slimy pear) and then batch-cooking the fruit in heavy sugar syrups. So I decided to make some adjustments. 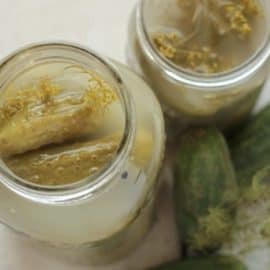 Now, generally, canning recipes are NOT something you want to adjust too much, as usually the “rules” are in place to keep the food safe to eat (for example–getting rebellious and canning low-acid food in a water bath canner instead of a pressure canner is a BAD idea). However, after a little research I determined the edits I wanted to make would still allow me to produce SAFE canned pears with a bit less work. Score! 1) I did not peel my pears. Most people choose to peel them to avoid the grainy texture, but honestly, this doesn’t bother me too much. You can definitely still peel them if you like, or you can just be lazy like me and leave them intact. 2) I did not use sugar. At all. 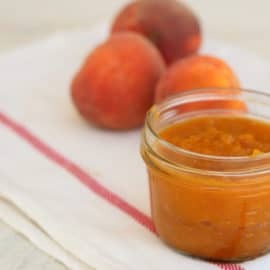 In many canning recipes, sugar acts as a preserving agent, however in canning peaches and pears, it is just for sweetness, which allows us to safely omit it. You can use honey if you like, but my pears were delectably sweet already, so I didn’t want to muddy the crisp pear flavor. 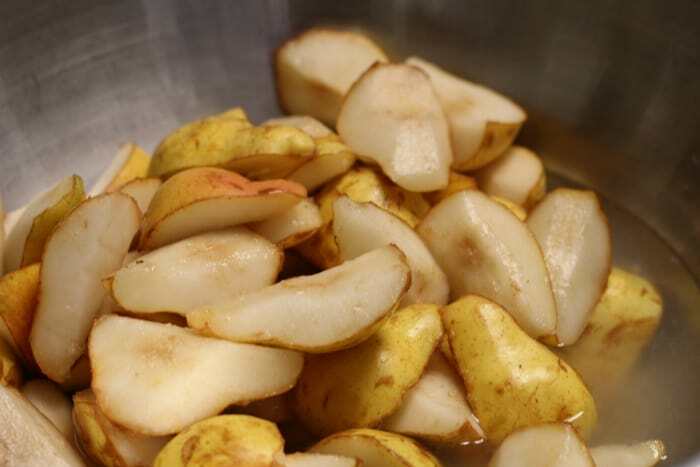 Allow the pears to soak for 2-3 minutes in a lemon juice bath. This helps to prevent discoloration. I mixed roughly 1/2 cup of lemon juice with 1 gallon of water, and then briefly washed/dipped the pears in the solution. (It definitely worked too! My pears didn’t discolor one bit). 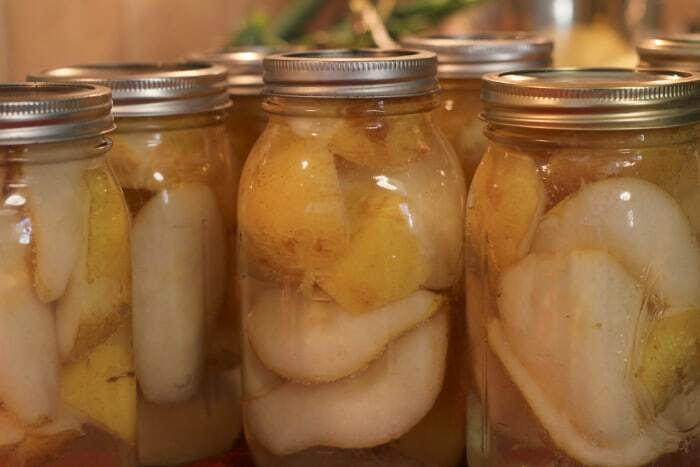 Pack the pears into hot, sterilized jars. Cover the pears with boiling water, leaving 1/2-inch headspace. Process in a boiling water canner: 25 minutes for pints, 30 minutes for quarts. 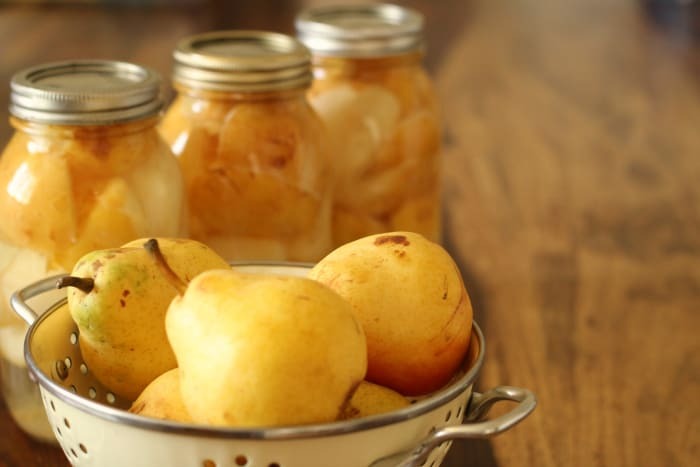 Enjoy your home canned pears in homemade yogurt, oatmeal, or straight from the jar! You can even use them to make my new favorite dessert: rustic pear tart with cream & spice. If you would like to sweeten up your pears a bit, you can add honey to your boiling water mixture. You’ll need to play around with the amounts, depending on how many pears you are canning and how sweet you’d like them to be. Avoid mushy, over-ripe pears for this recipe. Firm, ripe ones are the best. If you aren’t going to peel your pears, I suggest selecting organic varieties, as the peel often holds many of the icky chemicals. Looking to can peaches without sugar too? Try my Honey Cinnamon Canned Peaches. If you don’t want to can whole pears, try making pearsauce instead. Why cold-pack instead of hot-pack? 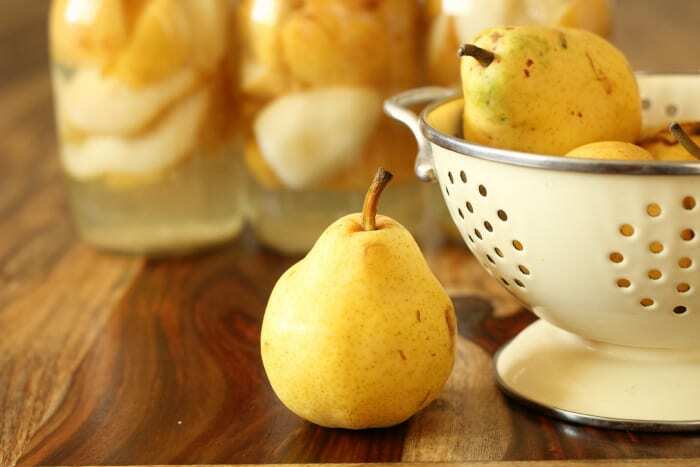 Many canned pear recipes call for you to cook the pears first. Although this is the method most often recommended, I found that many folks like to simply cold-pack their pears as well. The benefits of cold-packing are less mushy fruit and less work, although some folks complain that cold-packed pears are prone to shrink a bit after you jar them and float to the top. That doesn’t bother me much, but if you are concerned, simply cook your pears for 5 minutes in the boiling water before you place them in the jars. Proceed to fill the jars with the hot cooking liquid, and voila! You’ll have hot-packed pears. Does canning totally stress you out? Trust me, I have totally been there! Here are my best tips for no-stress canning. Allow the pears to soak for 2-3 minutes in a lemon juice bath. This helps to prevent discoloration. I mixed roughly 1/2 cup of lemon juice with 1 gallon of water, and then briefly washed/dipped the pears in the solution. 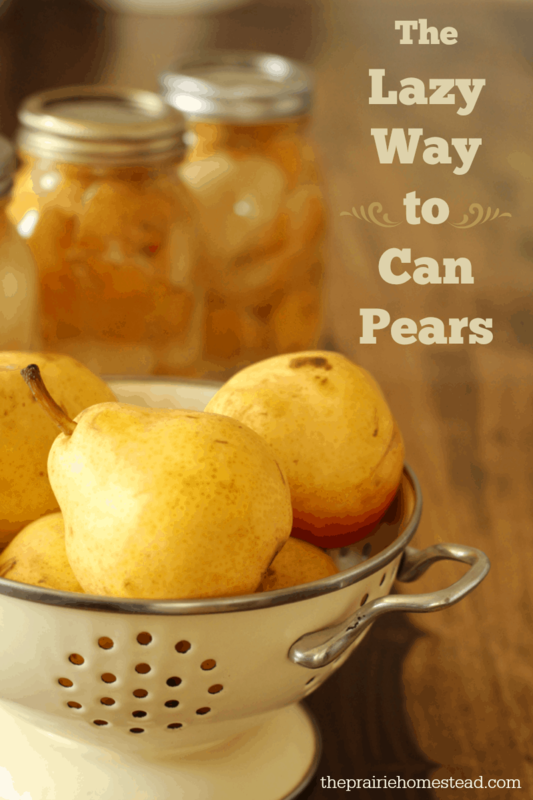 Enjoy your home canned pears in homemade yogurt, oatmeal, or straight from the jar! I am with you on the “high-efficiency” canning. I don’t can pears! I used to but when the kiddos would take them out of the jar they would just mash them up to put in oatmeal. I make pear sauce and don’t peel them for that either. We make pear muffins with the sauce too! Ok, now I’m hungry! I canned pears in plum sauce a couple years ago. Not good if you want big pieces of pear because the acid in the plum breaks down the pears. Was never big on pears, but they were amazing. So glad you got to come to Convention Julia! 🙂 Wasn’t it awesome?! Thanks for posting this. I like to cut sugar when I’m able. I thought the only way you could can fruit without sugar is to pressure can it? I am new at canning and would love to can fruit without sugar. Is this safe? And is there a link with more information on this? You could always preserve or add a bit of citric acid in your fruit if the “acid level” bothered you. I do this sometimes. Citric acid (is basically Vit C powder) is used to prevent discoloration like the lemon juice above. It also raises the acidity level of your fruit to an acceptable level to water bath can. Of course, one could argue that the lemon juice also does that. I think either way your good though. Nothing to worry about ! Water bath method is used for fruits, pickles and tomato products,they are high acid products and water bath is effective in killing bacteria, etc. Pressure canning is needed for meats and vegetables. They are low acid. I always put my canning in the oven instead of a water bath. I do this with beans and pickles. Will this work with pears as well? This is great! 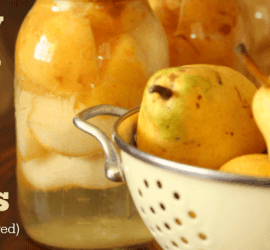 I was looking for a nice way to preserve some pears and came across this post. I’m also thinking about canning pear butter! Thanks for sharing! Awesome! We picked rustic heirloom pears here in Quebec last week-end. These beautiful dark red and green juicy pears. So pretty in the jars with the skin! Just for you : Our anti-browning solution : 1 gallon of water, 2 TBSP of salt, 2 TBSP cider vinegar… Does wonders! Do you rinse it off? It is quite salty. I have been canning for over 40 years. This sounds great!! How long will the pears last when canned like this? Could you be more specific? 1 year? More? I canned apples without sugar one time, but the apples lost some of their flavor after a few months. I have had success using apple juice when canning fruit. There used to be a product out on the market years ago called Sure Gel Light that gave the instructions to make jams without sugar and I loved it because sugar just masked the flavor of the fruits. I can’t find it anymore and the ones I have found as options to all the sugar uses sugar substitutes or fruit juices instead when I would rather use just the fruit. Are there any sources that you know of that tells which ones must have sugar and which don’t need it? Hmmm… I have’t seen anything like that recently– have you checked Amazon? There is a place that I have seen this item. King Arthur Flour has sure gel but I’m not sure in what quantities. I also highly reccomend Pamona’s Universal Pectin. Packages or bulk. Workstead Industries, PO Box 1083 Greenfield, MA 01302. Telephone 413-772-6816. Also available online. No sugar needed, so you can use as much or little as you like. Try Pomona’s Universal Pectin. We love it. Low sugar! I follow the Paleo diet and found several jam recipes on the Internet. Look for Paleo recipes for jams. Hope this helps. You can also slip the pear skins just as one does with peaches by dipping them in hot water, then cold. I also scald and slip my pear skins like peaches. I peeled them for years, until someone told me that commercially they slip the skins. I’ve been doing it ever since, it sure saves a lot of mess. Question: do you put the lids on after you put water into jars or after you have boiled the jars in the bath canner. It would seem that you put them on before as that what makes them seal, but I am a new at this and wanting to try canning. So just want to be sure. Thanks for all your interesting posts and helpful info, Jill. Thank you so much! I just knew I should be able to can peaches and pears without sugar! I will also add some cinnamon essential oil! Oh, I can’t wait! Now to find some peaches and pears! I learned how to can fruit without sugar a long time ago from my grandmother. She use to say why ruin the fruit with all the sugar. I think however, that I will try a few with the skin on to see if I like it that, because your right not peeling them would be a lot easier. I will try dipping the pears in the boiling water like I do the peaches. recipe for the anti-browning solution. P. S. I do like to pressure can my foods. 5 lbs. pressure for 8 min. on peaches and pears. rippen before I can them? 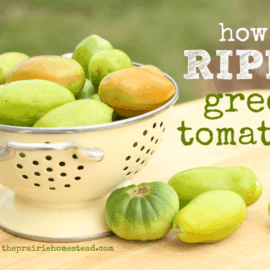 I’d let them ripen first– will give better end result. Loved reading this it’s like you took the words right outta my mouth! Thanks for the super easy instructions! I’ve jammed for years and am now trying my hand at canning… Peaches earlier and pears now. 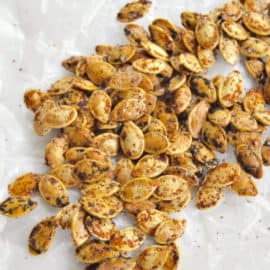 I have a batch in the water bath right now; pealed and with a super light honey water… My 6 year old son is convinced we are having them for lunch! This batch is Flemish, and the next will be Bosch. Sincere thanks for the efficient method!! Getting back into canning & my neighbor gave me a ton of firm pears. Haven’t canned pears before. 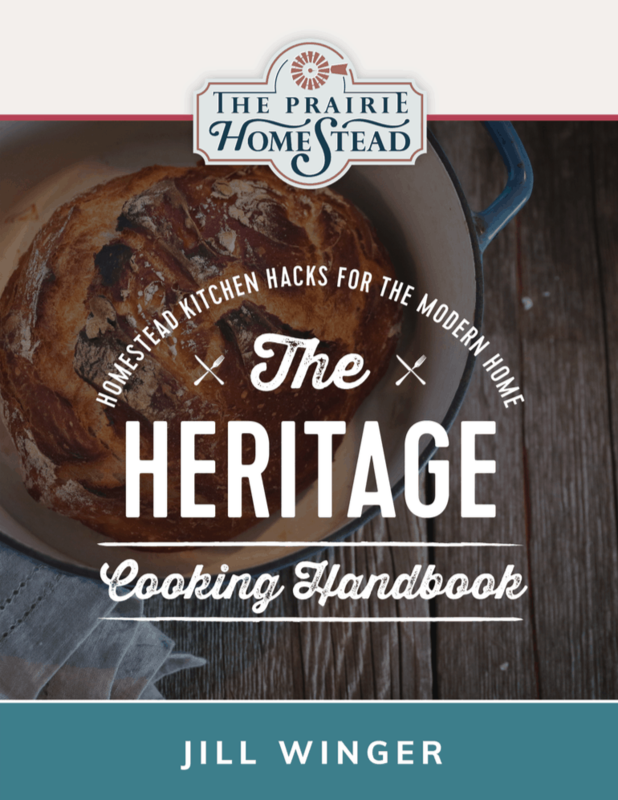 Question: I don’t have canning type cooker, can I just boil the jars after filling to create a safe seal? I don’t see why not if the pot you’re using is deep enough to cover the jars. I made raspberry jam once and my canning pot was packed up. I used my big cooking pot and it worked like a charm. Every single jar sealed. In a pinch, I would say yes. Thank you! I just learn to can this week. The dad of my husband have two pear trees. They canned 1/3 of it and the rest finish in the compost…. I had to do something. I’m pretty sure friend will enjoy it. i want to can diced pears. not sure when they are ripe enough to can. can i used diced pears in the same way as sugarless whole or half pears? Thank you. This is very helpful. I like the no sugar option very much. I prefer using the pressure cooker, how long would I pressure them and at what pressure? I am referring to the canned pears of today’s newsletter. I am even lazier than you, uh, more efficient. As we generally eat our pears on toast or pancakes or waffles, I simply press the quartered pears down into the jars until the space is all used up. just pears, no air except at the top, and no water. That way, the flavor of the pears is not washed into the canning water. they come out tasting very close to fresh. They last at least over a year, and, as food should be eaten within that time for best nutrition, I am happy! This is my second year of using this method and we are still finishing up the pears from last year, which look perfect still. Thanks for this blog, I am always learning something! Another way of canning pears without sugar which I’ve been doing for 40 years is in pineapple juice. Buy it in large cans. Not only are the pears delicious but they are beautiful in the jars with that pineapple juice. Plus you can drink the juice after eating the pears! Try Pomona’ s Universal Pectin for low sugar canning. We love it! My mother always canned when I was growing up. Then I worked in an office and never did it myself. After retirement , I started canning and love the way it looks and tastes. I use very little sugar and it tastes great on applesauce or peaches. I also can tomatoes. Its so relaxing and tastes so wonderful. 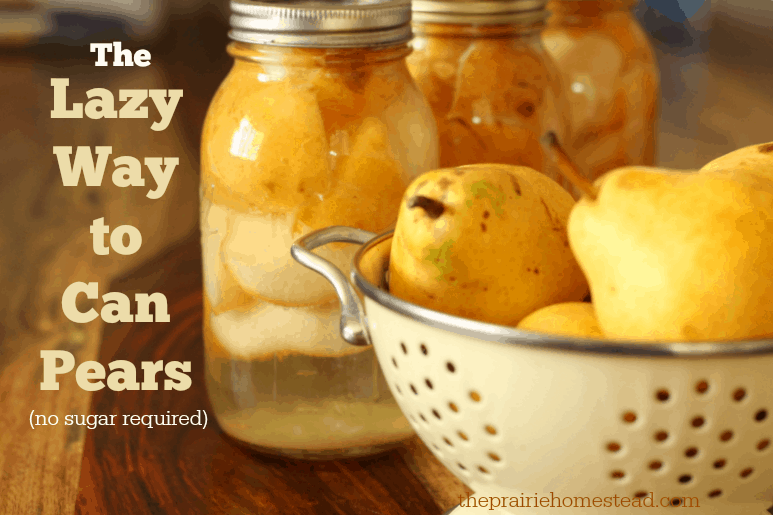 Plan to use your advise on canning pears. Loved the comments. Try adding 1/2 slim slice of lemon to your pint jar. Keeps the pears white and adds a nice tang to the pears and juice. My Mother did this and I have been doing it for years. In my canning class we were told the peelings on fruit contain a large amount of bacteria, and that’s why we should take it off before canning. That and chemicals! I would be very leery of eating any canned fruit with the skin intact. I was taught to peel, core, and remove all blemishes. My friend likes fried green pears. I will try them sometime. I get enough Bosc pears from my one tree to can 5 or 6 jars. The Bosc, although ugly are quite firm and just perfect when peeled and sliced into quarter lengths. This cold bath technique works beautifully for me.I Mix and boil 1/2 water and 1/2 juice from my Gravenstein apples, which are harvested earlier, made into cider and frozen. I add cardamom and cinnamon sticks to some of them.These come out firm enough to make rustic tarts, but also soft enough to add to yogurt. I use a pressure canner, how long would you pressure can the pears for. I have been thinking about not peeling them because it really is time consuming!! our family has blood sugar issues so I can in either organic apple or white grape juice from Trader Joe’s. The canned fruit tastes more like fresh fruit. Never had a jar go bad.